CP/M was an operating system which was a precursor to MS-DOS and uses quite a few of the same commands. 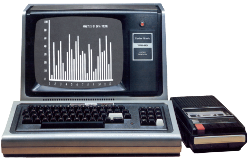 It loads starting from 0000H so TRS-80 Model I’s and III’s cannot run CP/M without modification. A Model 4 can run CP/M without modification. While I make no representations that it works, and take no responsibility for those who try, a possible modification to a Model I to allow it to run CP/M can be found here. A detailed discussion of CP/M, its origins and operation, are well beyond the scope of this site. For those interested, there is a Wikipedia page on the topic and www.cpm.z80.de is hosting a CP/M Plus Manual. It does not permit wildcards. Each filename must be entered, one at a time, each followed by two confirmations. It does not import, into CP/M, filenames which are not valid under NEWDOS/80, even if they are valid under CP/M. If not exited gracefully, the CP/M disk is rendered unreadble and you must start again, filename by filename. It will crash for a number of reasons, including running out space on the CP/M disk. It will not say what caused the crash, only that it crashed. It seems to have a maximum file size (I could not transfer a 131KB LBR file onto a CP/M disk which had far more free space than that). It cannot copy 0 length files. The current version of TRSTools, and more information, can be found on Matthew’s TRSTools Page. Jeff Post’s DSKDIR utility can be used to allow the user to extract files from a .dsk image file and write them to the host filesystem. The program is a work in progress, but this subset is being released so that users can determine what files are in a .dsk image file. The current version of DSKDIR can be found Here. One method of extracting files from CP/M disks to a PC is to use 22DISK, once made by Sydex, which is a set of programs for DOS to perform operations on CP/M formatted disks. There appears to be some level of controversy over distributing 22DISK these days (a good write up is here), but I suspect it has to do with Sydex putting up a web page offering to read old disks for people (something I do on this site at no charge). That said, a simple google search will produce many sites hosting this file. The most recent copy is v1.44 from October, 1996. If there is a CP/M disk with squeezed files, it is probably a lot easier to extract them outside of the emulator environment, not only for speed, but for disk capacity. Carson Wilson wrote CFX (CP/M File eXpress) for this purpose. CFX is a universal utility written in the C programming language, whose main purpose in life is to make access to files stored under the CP/M operating system accessible to users of other operating systems. CFX will extract to screen or disk normal, squeezed (typical CP/M filename extension, .?Q? ), crunched (.?Z? ), CrLZH (.?Y? ), and library (.LBR) files. It will also display library file directory information and embedded compressed file datestamps and comments. CFX is an interactive, integrated utility, and as such can prompt the user before displaying files, page the screen, etc. The most recent version of CFX (July, 2006) can be found can be found Here. Display the contents of the specified file on the display screen. Switches to one of 16 specified user area in a disk drive. A user area is a physical area on a disk which has its own directory and which is managed seperately from the rest of the disk. Data cannot be read from or written to any user area other than that in which CP/M is currently operating. Upon cold boot, the user is automatically logged in to User Area 0, which is compatable with CP/M 1.4 directories. The USER command allows the user to move to another logical area within the same directory; areas are numbered 0-15. The ERA, DIR, REN, SAVE, and TYPE commands apply to the current User Area. STAT List the number of bytes of storage and data on the currently logged-in disk, provide statistical information about particular files, and display or alter device assignment. STAT x:afn [$S] Scan the specified files on the specified drive (x: is optional), and list all files which satisfy the unambiguous reference in alphabetical order with storage requirements. STAT x:=R/O Set the specified drive to Read Only. This is cleared by a warm boot. When a disk is Read Only, the message BDOS ERR ON x: READ ONLY will appear if there is an attempt to write to it. STAT USR: List the User Number the user is currently in and the User Numbers which have files on the currently addressed disk. PIP Engage PIP, prompt the user with ‘*’, and read command lines directly from the console. PIP used in this way is exited by either typing an empty command line (just a carriage return) or a Ctrl-C as the first character of the line. PIP x:=y:afn Copy all files satisfying afn from drive y to drive x. ‘y’ may be omitted, and, if so, the currently logged-in drive is selected. PIP x:ufn=y: Copy the file given by ufn from y to x. ‘x’ may be omitted, and, if so, the currently logged-in drive is selected. PIP x:afn=y:afn Like the above, but x and/or y may be omitted; the default drive is selected for the omitted drive(s). SUBMIT Allows CP/M commands to be batched together for automatic processing. XSUB The XSUB command extends the power of the SUBMIT facility. When specified as the first line of a SUBMIT File, it self-relocates directly below the CCP. All subsequent SUBMIT command lines are processed by XSUB, so that programs which read buffered console input (BDOS Function 10) receive input directly from the SUBMIT File. While XSUB is in memory, it prints the message “(xsub active)” on each warm boot. ASM Load the CP/M assembler and assemble the specified program from disk. LOAD Load the file in Intel “hex” machine code format and produce a file in machine executable form which can be loaded into the TPA (this loaded program becomes a new command under the CCP). As Perform inline assembly starting at the specified address s.
D Display memory from the current address for 16 display lines. Ds Display memory from address s for 16 display lines. Ds,f Display memory from address s to address f.
Fs,f,c Fill memory from start address s to final address f with byte c.
G Start execution at the current value of the PC. Gs Start execution at the specified address s.
Gs,b Start execution at the specified address s and set a breakpoint at the address b.
Gs,b,c Same as above with breakpoints at b and c.
G,b Start execution at the current value of the PC with breakpoint b.
G,b,c Same as above with breakpoints at b and c.
If Insert a file name f into the default FCB. L List 12 lines of disassembled code from the current address. Ls List 12 lines from the specified address s.
Ls,f List lines of disassembled code from s to f.
Ms,f,d Move the block from address s to f to destination at address d.
R Read file in FCB into memory at 100H. Rb Read file in FCB into memory with offset b from 100H. Ss Set (examine and alter) memory starting at address s.
T Trace the next instruction. Tn Trace the next n instructions. U Untrace — like Trace, but intermediate steps are not displayed. X Examine all registers and flags. DUMP Dump the contents of a file in hex. SYSGEN Generates an initialized disk containing the CP/M Operating System. Once invoked, the user is prompted through the session. MOVCPM Regenerate the CP/M system for a particular memory size. DUP Format and/or Duplicate a disk. The address of the DPH is obtained by calling the SELDSK entry of the BIOS, which returns its address in the HL register pair. 00h XLT Address of parameters used for skew translation. Pass the address when calling the SECTRAN entry to the BIOS, unless it is 0000h meaning that the drive does not use sector skew. 08h DIRBUF Address of a 128-byte buffer, located in the BIOS, used for directory I/O by the BDOS. Only one buffer is provided; all DPH blocks address it. 0Ch CSV Address of an area where the BDOS builds a directory check vector when it logs in the disk on this drive. The size of the area is given in the DPB, and may be zero, in which case this field is ignored. 0Eh ALV Address of an area where the BDOS builds an allocation vector when it logs in the disk on this drive. The size of the area is determined from the disk capacity, which appears in the DPB. The address of the DPB is obtained with BDOS service request 31, Get Disk Parameters. The table is located in the BIOS. 00h SPT “Sectors” (128-byte records) per track. 02h BSH Number of times a record number should be shifted right to yield its allocation block number (or, the base-2 log of the number of records in a block). Get the size of an allocation block by doubling 128 BSH times. 03h BLM Mask which, if ANDed with a record number, yields its index within an allocation block (or, 2^BSH – 1). 04h EXM Number of times a logical extent number should be shifted right to yield a physical extent (directory entry) number (or, the base-2 log of the numberof logical extents per entry). 05h DSM Highest allocation block number (count of blocks is one greater). Get disk capacity in records by shifting DSM+1 left BSH times. 07h DRM Highest directory entry number (count of entries is one greater). Shift right twice for number of records in the directory; shift BSH times fir number of blocks. 09h ALn Initial value for the first two bytes of the allocation vector, with a leading 1-bit for each directory block. 0Bh CKS Number of bytes in the directory check area. Either (DRM + 1) / 4, one byte per directory record, or 0000h to signify no checking of a fixed disk. MP/M 2 (and CP/M 3? ): Most significannt bit is set to 1 to show that this drive’s disk is fixed, not removable. 0Dh OFF Count of reserved tracks, usually 2 or 3 for diskettes, but may be large when a rigid disk is partitioned into logical drives.